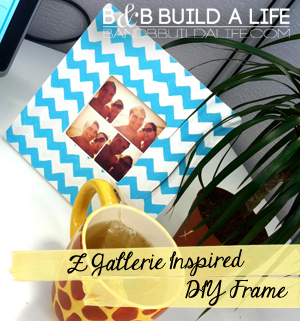 Way back at the start of all this, I made a Z Gallerie inspired frame that was, you guessed it, teal and white chevron. Ok, not bad. They came out really fabulously, and I had enough fabric leftover to cover a few down-filled ikea pillow forms with the same fabric. Ok, justifiable. Why wouldn’t you make pillows with leftover fabric so they match? Right? …..so we still have fabric leftover. And there was this ugly, off centered intercom that drove me nuts. So Bill & I created this handy way of dressing things up. With more chevron! Yes. That is a chevron and glitter ornament. To my credit, it’s the teal blue but then silver glitter, not white. So there’s some deviation there, right? Wait! That’s not even blue! Mwahaha finally I’ve used chevron without my signature color! …but it’s still chevron. Oh well. It still is a useful information station on the fridge. Can’t blame me for this one. Nope. This one’s all Z Gallerie’s fault for having a fantastic clearance sale and allowing me to find this candle. I mean, it called to me! And then inspired me to create this candle stand inspired by a product at Target. Ok. Denial is the first sign that something’s a problem, right? Then yeah, I’m in trouble. Big trouble! To my credit, I’ve kept it to smaller things (excluding the statement making drapes) and balance things out with things like our over-sized charcoal couch. You have to add some fun to a room with a big charcoal couch otherwise it starts to get dark and dreary. But I can’t yet promise I’ll cease my chevron ways. ….and yes, that’s a hint to some upcoming projects! Next Post Sea Glass Decor – Update!